Sanitrol provides a customized inventory management system for consumable supplies for many of our customers. 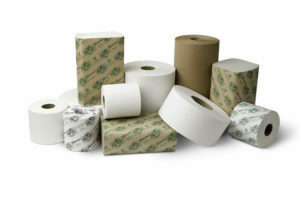 We provide the best quality paper, liners, and soap products that deliver the highest value & best pricing. Whether you need hand towels, toilet paper, liners, soap, deodorizers, sanitizer, paper plates, napkins, etc, Sanitrol has you covered and can save you money!! For further information, please contact us directly so that we can you an assessment and a free quote on all of you consumable supplies.